Patio Landscapes... Landscaping your way to beautiful Patios. 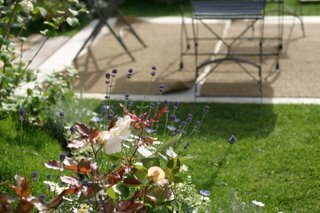 Do you find yourself looking at pictures of patio landscapes and wondering why your own patio is not a thing of beauty? Do you wish that your own backyard living space were picture perfect? On the other hand, maybe those patio landscapes that are featured in magazines are too fancy for you, and you simply want an environment where you can enjoy yourself on a hot summer day. There are many reasons for wanting a beautiful patio living space, and whatever your reason is, you can achieve a gorgeous patio with a little bit of planning and some hard work. You need to decide what you want in your patio space. It is generally a good idea to think about this for a while and walk around your neighborhood to see what other people have done. Look at pictures of patio landscapes in magazines and cut out the things that you really like, and the elements that you would like to incorporate into your own yard. The best thing to do is to plan the hardscape portion of your landscape design. This refers to the deck or patio, walkways and paths and water features. These items tend to be labor intensive and provide a good foundation for the rest of your patio space. After you plan this portion, you can begin looking at the softscape, or the plants and flowers that you would like in your yard. Choose a patio material that will suit your family and your environment. Do not choose a wooden deck if you do not want the maintenance that may be involved in keeping it looking beautiful, choose a tile or concrete patio around pools, and bricks and patio blocks make beautiful patios and walkways as well. The important thing is to choose a patio style that will fit in your budget and provide the type of look that you are looking for. Once the patio and walkways are in place, you can begin planting. If you have children, you may want to consider incorporating grass into your design. Patio landscapes with a lawn area are perfect for children to run around in and play. When you are planning your garden areas, choose plants that will grow and thrive in your zone. There is no point choosing a beautiful, tropical variety of shrub if you live in Montana, it will fail. Do not set yourself up for failure by choosing plants that will not thrive in your conditions. It is also important to choose plants for your lifestyle. Even if you do not like to garden, you can choose landscaping plants that will require only a very minimal amount of effort. 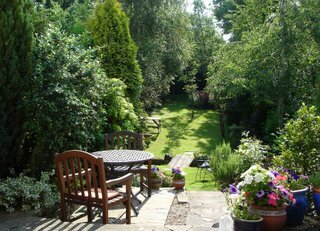 Certain types of trees, shrubs and perennial flowers will grow unaided and create a lush environment around your patio. With such a wide variety of plants and greenery, you will find something to suit you, no matter what your gardening style may be. With a little bit of planning, you can stop dreaming of patio landscapes, and start living in your very own beautiful backyard. The one thing that all patio landscapes have in common is a little bit of planning and hard work.